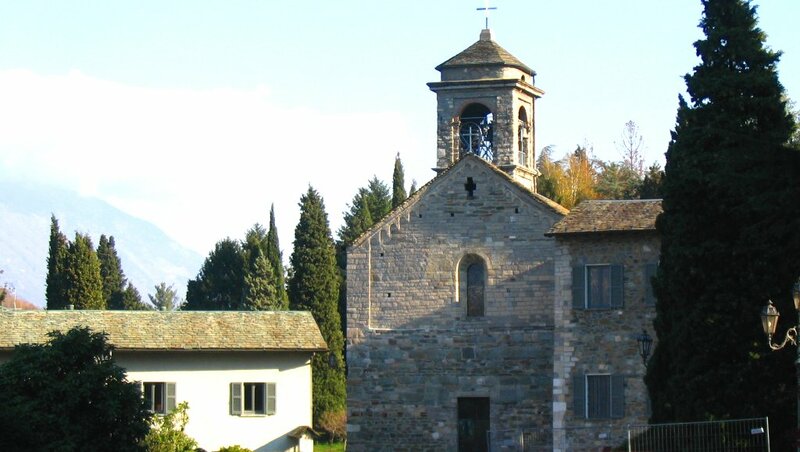 Some twenty kilometres north of Varenna, a perfect ending to this tour is the medieval Piona Abbey, close to the northern tip of Lake Como. If you are driving, leave the main road (the toll-free highway no. 36) at the signposted exit and head towards Dorio. After covering three kilometres take the turn-off to your right. Once you've gone through Olgiasca you descend towards the abbey along a cobble-paved road through woods. Another option is to get here over the lake, taking the boat for Colico. The Abbazia di Piona was founded by Cluniac monks in the 12th century on a headland that juts out into the lake. After being abandoned for long centuries, it was restored in the early 20th century and entrusted to monks of the Cistercian order who make liqueurs and herbal teas here. The buildings of the Piona Abbey include the church of San Nicolao with its adjoining cloister and, at its rear, the remains of an oratory dedicated to Saint Mary. The church, which was consacrated in 1138, has a simple gabled façade. The interior is austere; two lovely marble lions support the stoup. The quadrangular cloister in late Romanesque-early Gothic style has slender pillars with capitals embellished with geometric and fantasy figures; its walls are frescoed. Most of the forty-one pillars holding up the arches are made of white marble quarried locally, near Piona. Preserved on the walls of the cloister are fragments of frescos and decorative motifs: one of the most significant is a calendar depicting the months of the year. North of Piona the mountain resorts of the Valtellina are very popular, both for summer hikers and winter skiers. But if you're heading back to the plain, take note that Como is about 70 kilometres south, and Milan 85.